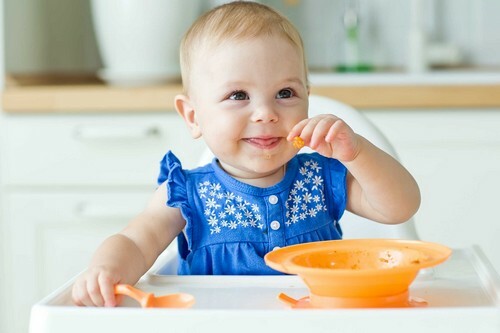 Starting Solids: What Do I Need? Weaning your baby is an exciting phase—but with all the latest gadgets, gizmos, and fancy pre-made nosh, it can also get expensive. Here’s what you really need to properly introduce your tot to the world of food (and it doesn’t have to break the bank). Weaning can usually start in a bumbo seat, but once your little one is more sturdy, a high chair is a must-have investment. It keeps baby upright, reducing choking risk, and improving digestion. Think safety first when choosing the chair, and then make sure it’s easy enough to clean (a lot). A wipeable floor mat will catch the inevitable spills—plus the plentiful debris once you introduce finger foods. At the end of a meal, simply gather up the mat, and empty out into the garden—followed by a hose down. Bibs are an obvious essential, but not all are made equal; go for soft fabric ones in the beginning, and then graduate to plastic or silicone ones with a ‘catchment’ lip to avoid food becoming squelched under little legs. Plastic dinnerware seems logical given that your baby is still working on dexterity (as well as experimenting with the laws of physics), but plastic isn’t the best choice because of toxicity risk. Opt for bamboo bowls, plates, and silicone cutlery instead. Brilliant Brekkie: Cheesy Veggie Egg Mini Muffins!Beauty Products in Pregnancy: What’s Safe?